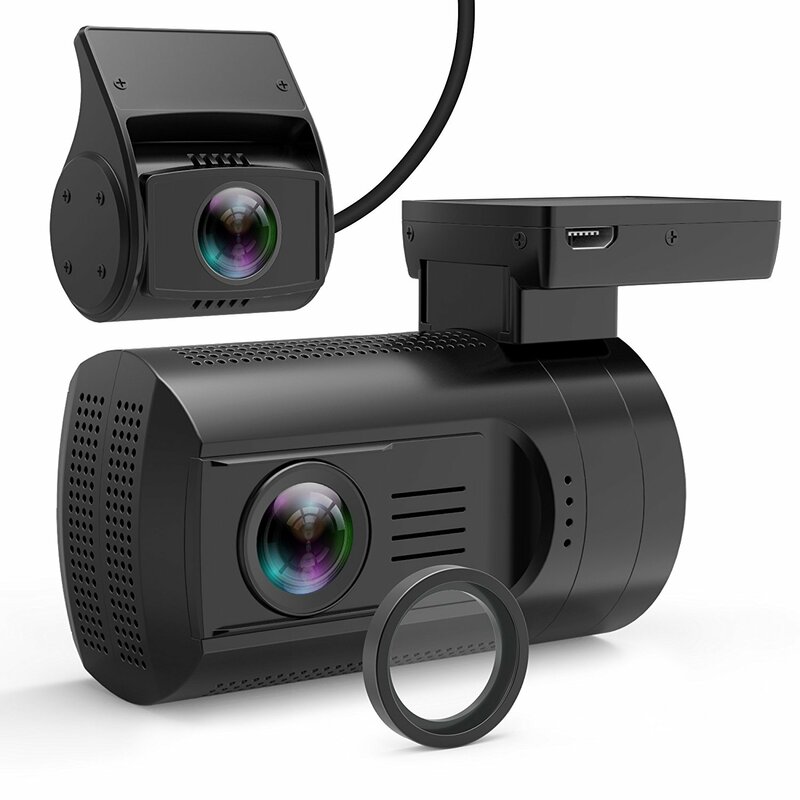 The K1S is the first dual 1080p dash cam that features two small cameras that can be installed separately from the recording unit. As a result, this is one of the stealthiest dash cams yet: The actual front and rear facing cameras that need to be installed in your car’s windows are very small, and the recording box, which is about the size of a deck of cards, can easily be stowed away in the glove box or elsewhere. Released in early 2015 by the Chinese company Koonlung, the K1S is still quite new, so we can’t say too much yet about its long-term reliability. Video quality is good at day time, with front and rear footage being of pretty much similar quality. At night, video footage is average, with the front camera performing a little better than the rear unit due to its higher bit rate (13 vs. 9 Mbsp, respectively). The K1S consists of five parts that are all interconnected by cables: The main unit, the front and rear cameras, the GPS module (optional), plus an external button (also optional) that serves as “emergency” file lock button. The button can also be used to start and stop recording. Five parts connected by cables, plus the power supply, make for quite a bit of cabling to be done to set up this device. Fortunately, all cables and plugs are clearly labelled, so there’s no danger of becoming confused about which cable goes where. Like all dash cams, the K1S has auto on/off, loop recording, and time/date stamps on video, plus a speed stamp if you’re using GPS. Note that the speed stamp can be set to turn off once you exceed a certain speed, so you won’t be collecting evidence against yourself in case you exceed the speed limit at times. This is an interesting idea for those who like to use GPS but don’t necessarily want their travel speed recorded at all times. The K1S supports a parking mode that makes the camera come alive when an impact is detected by the G-sensor. Parking mode isn’t buffered though, so it will only record whatever happens after the impact, not what happened before. This dash cam comes with a built-in microphone and speaker, but audio recording is poor, making it hard to understand what’s being said inside the car. The K1S also includes a cable for playing back video on the screen of your car’s DVD player if you have one. According to the manufacturer, the device takes SD cards up to 64GB in size, which can hold about 5.5 hours of video (front and rear). Users have reported that it works fine with 128GB cards, too. While this camera does use an internal battery, another feature that stands out is that unlike most other dash cams, the K1S allows you to exchange the battery if necessary (i.e. if the battery dies). The battery is of a standard size also used in many action cameras, so it shouldn’t be difficult to find a replacement. To summarize, the K1S concept is an interesting development on the dash cam market, and one that’s been long awaited by those who’d like their dash cam installations to be more discreet. While video and audio quality aren’t perfect, the camera does its job reasonably well compared with most other dual channel dash cams. Also, it introduces several attractive features that other dash cam manufacturers will no doubt take note of. It’s definitely worth giving this device a try if you favor a stealthier setup that doesn’t force you to have all the hardware dangling widely visible in your car’s front window. Day time front video quality is good, bright and colorful. However, video footage is not the sharpest we’ve seen. Day time rear video is good too. Quality is similar to the front camera’s footage. License plates are readable while driving by. At night, the front camera’s video quality is only average. Lots of glare from lamps and head lights. License plates can be read from up close, but not from further away. Night video quality is slightly below average. Footage is a bit blurry and license plates are hard to make out, unless very close and moving slow or standing.